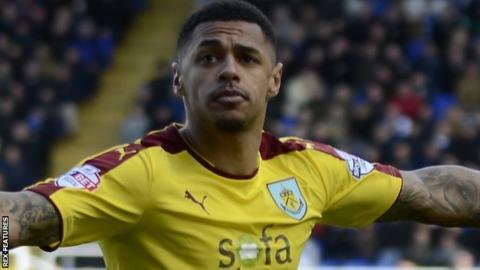 Burnley's Andre Gray would swap his Championship Player of the Year award for promotion to the Premier League. Striker Gray, 24, was named the best player in England's second tier at the Football League Awards on Sunday. On Saturday, he scored his 22nd goal of the season for the Clarets as they won 2-1 at Birmingham to stay second, two points behind leaders Middlesbrough. "Awards mean nothing to me," said Gray speaking after Burnley's win at St Andrews. "The only award that means anything to me is that automatic Championship medal. "Whether we do it as champions, which we want to do, or we do it as runners up we want to do that and that's what means the most to me. Everything else comes as an icing on the cake." Gray moved to Burnley from Brentford at the start of the season as boss Sean Dyche attempted to return to the top flight at the first attempt. "I don't see what the pressure is," added Gray. "We've chosen to do this job and that's what we came here for. "A lot of people are forced to do a job to pay the bills, they're forced to work for someone they don't want to and I think that's pressure. "The dream is getting to the Premier League and that's my dream as well. "It's not pressure, it's our job and it's what we enjoy. If you're not enjoying it then I don't see what the point in doing it is."